1902. California Wells Fargo & Co. HK-296. Rarity 7. NGC graded MS-63. 40 mm. Silver. Nicely toned. Includes the original presentation case. This medal was struck privately for presentation "on or about" March 18, 1902 "to each employee…in Company's service for…one year" or more. Research fails to establish identities of designer or striking firm, according to the Hibler-Kappen source on So-Called Dollars. Estimated Value $300 - 350. 1904 SC$1 HK-304 Louisiana Purchase Rarity 3. NGC graded MS-64. Estimated Value $100 - 125. 1904. Louisiana Purchase Admission. HK-306. NGC graded MS-61. 32.5 mm. Brass. Struck for the St. Louis World's Fair #28545. Prooflike surfaces. Estimated Value $50 - 75. The Dr. Charles Ruby Estate. 1933. Montana Dollar. HK-820. NGC graded MS-64. 40 mm. Silver. Toned. Estimated Value $250 - 300. Hoffman Collection of World's Columbian Exposition Medals. 1870 MA HK-13 SC$1. Pilgrim Jubilee Memorial. NGC graded MS-61. Deep multiple color toning on obverse. Trace of old cleaning. Silver plated on a copper planchet. 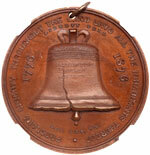 This medal was struck for a celebration sponsored and staged by Pilgrim Society, chartered in 1819. The Society organized "to. honor memory of Pilgrim Fathers. to procure. suitable lot for erection of a monument" to their "virtues, enterprise and unparalleled sufferings. First meeting held May 18, 1820; on the first Forefathers Day celebration, Dec. 21, 1820, Daniel Webster was principal speaker. 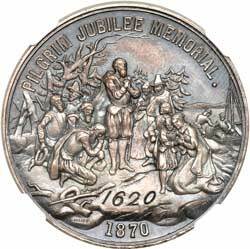 Obverse: Scene depicting Landing of Pilgrims; above Pilgrim Jubilee Memorial; below all 1620 / 1870; to l. of 1870 microscopic J. E. Ellis F; to r. microscopic A. C. Warren. Reverse: Holy Bible within central wreath, bird above; above all "Whose Faith Follow"; below all microscopic J. E. E.
1902. HK-296, Rarity 5. 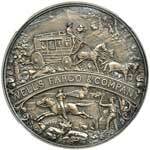 Wells Fargo & Company Semicentennial. NGC graded AU Details, Mount Removed. A popular So-Called Dollar. Estimated Value $200 - 250. 1933 SC$1 HK-820 Rarity 5 Montana Dollar. NGC graded MS-65. Beautiful rainbow toning on both sides, a boldly struck Gem. 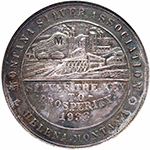 The Montana Silver Association, with headquarters in Helena, Montana, had as its purposes "To unite and encourage, through organization, those who believe in the restoration of silver in the monetary system of the United States and other leading powers throughout the world." Frank H. Cooney, Montana governor, and J. E. Erickson, U. S. senator, were prominent among members of the advisory council. Council and board of directors were composed of U. S. congressmen, state senators and representatives and other state, college and private industry leaders. 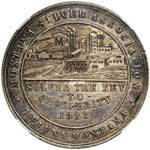 As a means of financing its activities the organization adopted a silver medal, to be issued to members instead of a membership card upon payment of $1 dues. The medal contains one tray ounce of silver.999 fine. Net profit to the association was about 55 cents after silver and die costs had been paid. 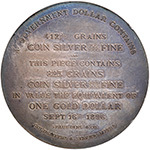 According to C. R. Brazier, organization secretary, 2225 medals were ordered struck, with initial shipment consisting of 300 pieces; distributed by Union Bank and Trust Co., Helena. Actual number of pieces issued cannot be established, but many medals were melted and most authorities agree that there are substantially fewer than 100 specimens extant today. 1896 Bryan Silver So-Called Dollar. HK-777, S-1, Rarity 6. NGC graded AU-58. This is the 1896 original issue with "Bryan" countermarked on obverse and "Tiffany & Co." on edge. Ex B. Max Mehl Sale, Lot 2469. 1896 Bryan-Jaccard Silver So-Called Dollar. HK-1010, S-4, Rarity 9. NGC graded MS-62. Only 2 to 4 examples know to exist. No "Tiffany & Co." on edge. The key type for these uniface issues. 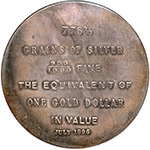 1896 (1910) Bryan Silver So-Called Dollar. HK-777, S-2 (? ), Rarity 6. NGC graded MS-62. The 1910 restrike issue, as indicated on the holder. "Tiffany & Co." on the edge. Nicely toned and very rare. 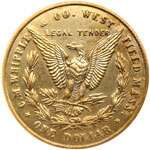 1900 Lesher So-Called Dollar. HK-789, Z-3, Rarity 5. NGC graded MS-63. A. B. Bumstead. No. 869. Nicely toned. 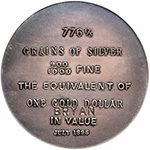 1900 Bryan Silver So-Called Dollar. HK-783, S-12, Rarity 6. NGC graded MS-63. Gorham Mfg. Co., reeded edge. Rarely seen in this high grade. Lovely blue toning with prooflike surfaces. Estimated Value $600 - 650. 1896 Bryan Silver So-Called Dollar. HK-786, S-17, Rarity 5. NGC graded MS-61. Spaulding & Co., G. W. Townsend "1900". A nicely toned piece. Estimated Value $350 - 400. 1896 Bryan Silver So-Called Dollar. HK-781, S-7, Rarity 5. NGC graded UNC Details, Improperly Cleaned. Gorham Mfg. Co. uniface type. Nice even toning on both sides. Estimated Value $200 - 225. Ex B. Max Mehl Sale, Lot 2468. 1896 Bryan silver So-Called Dollar. HK-785, Rarity 5. By Gorham Silver Company. Fine and Bent. 1901 New York So-Called $1. 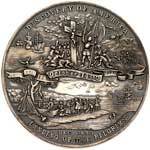 The official medal of Pan-American Exposition. HK-289, Rarity 3. NGC graded MS-65. Buffalo, NY. Struck in brass, 34 mm. Bright surfaces with no mentionable detractions. 1933. 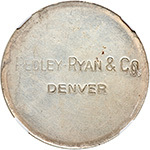 Pedley-Ryan So-Called Dollar. HK-825, Rarity 5. NGC graded MS-62. An interesting stamping error occurred on this example; the O and following period from CO were clearly double stamped. The untoned silver surfaces are reflective. Scarce and highly collectible. A book filled with silver and copper medals. Includes a few better medals, such as HK-344. Lot of 35 coins. 1893 World's Columbian Exposition, Declaration of Independence Dollar. HK-157, Rarity 5. Struck in white metal, 59 mm. This issue was probably designed by Rudolph Laubenheimer and struck by Boldenweck & Co. Chicago. A rare type which is quite difficult to locate in the current market. Toned AU with minor edge nicks. Estimated Value $400 - 500. 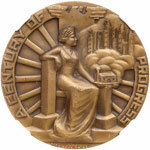 1933 Century of Progress Expo Medal. Bronze, 57 mm. This is the 2¼-inch large version of the 1933 Chicago Expo So-Called Dollar (HK-463). 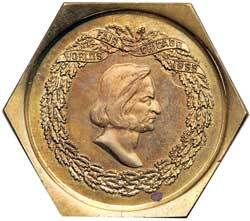 Designed by Emil Robert Zettler, the dies were produced by Medallic Art Co., and these medals were struck in the Mint Exhibit on grounds. With the original box. The medal is in Choice UNC condition. 1939 NY HK-493 Lincoln So-Called Dollar. New York World's Fair. NGC graded MS-63. Estimated Value $450 - 500. 1892-1893 World's Columbian Exposition Official Award Medal. Eglit-90, bronze, 76.3 mm. 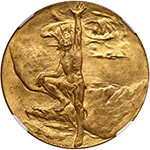 This is the large format medal of the famous so-called dollar by Augustus Saint Gaudens and Charles E. Barber, HK-223 Eglit-19. 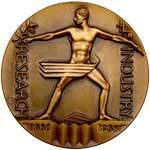 This medal started the long rivalry between the two artists. 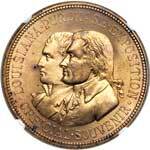 The obverse was designed by Saint Gaudens with a masterful engraving of Columbus stepping onto the New World, while the reverse was designed by Barber, more conservatively, with a traditional medallic layout of inscriptions in 6 lines, symbolism patterns like torches, ship, and angels. 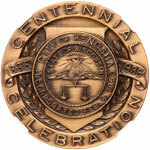 Both sides were signed by the designers, and the medal was issued to Kanawha Coal Exchange. A true masterwork of American engraving art, and extremely popular for showing the beginning of the conflict between the two great artists. The medal is in UNC condition, except for some spots. Estimated Value $200 - 300. 1892 Illinois Columbus Bust so-called dollar. HK-231, Eglit-426, Rarity 6. 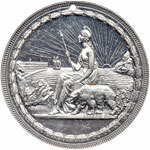 NGC graded Medal MS-62 Prooflike. White metal, 40 mm. Holed at the top. Pop 3; none finer at NGC. Estimated Value $100 - 120. 1893 Illinois, Chicago World's Columbian Expo so-called dollar. HK-169, Eglit-18, Rarity 4. 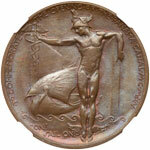 NGC graded Medal MS-62 Prooflike. Aluminum, 40 mm. 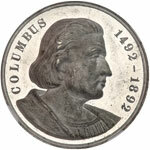 The obverse depicts the landing of Columbus, and the reverse describes the facts about Chicago, including population, size of the city, numbers of streets and churches. Pop 3; 2 finer in 63. A lot of Columbian Half Dollars and other commemorative items related to the event. Consists of: a pair of 1892 Columbian Half Dollar, one housed in an original Wells Fargo distribution holder with wax sealing, AU to UNC (2); a pair of 1893 Columbian Half Dollars, one mounted on an Expo badge probably as souvenir, another one mounted on a sterling silver money clip, both damaged EF coins (2); a rare old leather holder for the 1892 Half Dollar, About New (1); the 1893 Official Medal, Type 1, brass, HK-154 Rarity 2, AU (1); 1893 W. M. Deering & Co. aluminum token for the Columbian Expo, holed at 12 o'clock probably as made, UNC (1); 1893 bronze badges of Ohio and Chicago, both UNC (2). Closer inspection recommended before bidding. Lot of 6 coins and 2 badges. 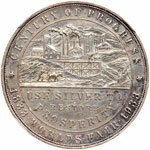 1876 U.S. Centennial Expo - Liberty Bell Dollar. HK-25, Rarity 5, Round 6 Type. NGC graded MS-64 Brown. Bronze, 38 mm. The large bell variety of the design. Holed at 12:00 as usual with the ring still remaining. A well struck piece with old-time even toning on both sides. Pop 6; 4 finer, 2 in 65, 2 in 66. (C. 1890's) Whipple Dollar. HK-832, Rarity 5. ANACS graded MS-63. Gilt bronze, 38 mm. 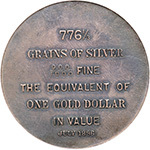 The controversial uniface dollar in mint state grade. The golden color is still even, with some areas starting to tone. Estimated Value $100 - 150. 1892 World's Columbian Expo - Liberty Head Dollar. HK-220, Rarity 5. NGC graded MS-64 Brown. Bronze, 35 mm. The high relief variety of this beautiful so-called dollar. Semi-reflective surfaces on both sides. Pop 5; 9 finer, 7 in 65, 1 in 66, 1 in 67. 1892 Columbus Bust Dollar. HK-224, Eglit-207, Rarity 5. NGC graded Proof 63. White metal, 38 mm. Issued for the World's Columbian Expo. A beautiful unholed example. 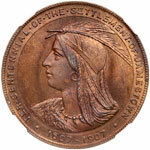 Even the NGC holder indicates this as a proof strike, it is probably a mint state coin with deep prooflike surfaces. NGC census report available for MS or PL examples only, but based on the fact that the highest graded piece is only a MS-64DPL, this coin probably is among the top grade examples, if not the finest graded. 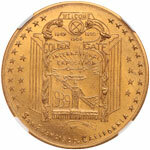 1894 California Midwinter Expo - Electric Tower Dollar. HK-249, Rarity 4. NGC graded MS-64 Prooflike. Aluminum, 38 mm. Holed at 12 o'clock as commonly seen on this type. The state seal side bears deep reflective surfaces. Pop 8; 4 finer, 3 in 65, 1 in 66. 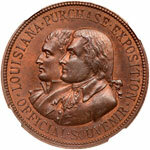 1904 Louisiana Purchase Expo Dollar. HK-301, Rarity 6. NGC graded MS-65 Brown. Copper, 33 mm. 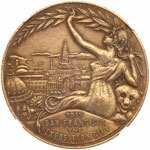 The official souvenir medal of the 1904 Expo, and the second rarest type of this series. 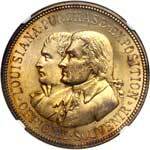 The portraits of both Jefferson and Napoleon on the obverse may attract the attention of collectors working on various topics like Louisiana Purchase, American History, or Napoleonic items. A lustrous piece with some mint red still remaining. Pop 3; 1 finer in 67. Estimated Value $200 - 220. 1907 Jamestown Tercentennial Dollar. HK-346, Rarity 4. NGC graded MS-66 Red & Brown. Bronze, 34 mm. The official medal of the event. This piece is among the finest examples the cataloger has ever encountered. Glossy satiny surfaces with plenty of mint red under light even original toning on both sides. Pop 3; none finer at NGC. Tied for the finest examples graded by both services. 1907 Jamestown Tercentennial - Battleship Virginia Dollar. HK-349, Rarity 4. NGC graded MS-64 Prooflike. Brass, 36 mm, small dates. 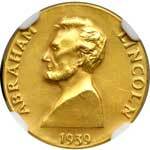 A fresh golden example of this beautiful commemorative issue. The smooth surfaces enhance the contrast between reflective fields and frosty devices. Pop 9; 2 finer in 65. 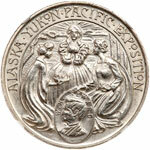 1909 Alaska-Yukon-Pacific Expo Dollar. HK-353, Rarity 5. NGC graded MS-62. Silver, 32 mm. The official medal of the event. A frosty untoned silver coin. 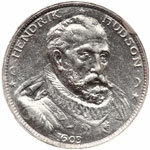 1909 Hendrik Hudson Daalder. HK-374, Rarity 5. NGC graded MS-64. Aluminum, 15 mm. Issued for the Hudson-Fulton Celebration in 1909, and the same size as the gold dollar. Pop 16; 1 finer in 65. 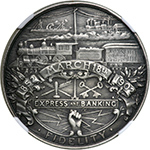 1915 Pan-Pacific Expo - San Francisco City Dollar. HK-418A, Rarity 7. NGC graded AU-58. 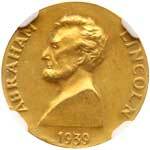 Gilt bronze, 37 mm. 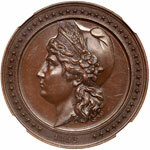 The series of city dollars is rare per se, but this particular type struck in gilt bronze is even rarer. 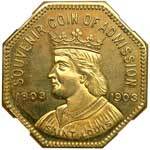 The coin was evenly worn and still with plenty golden color remaining. The surfaces are smooth and no unattractive spots, discoloration, or scratches shown. A pleasant piece from an old collection and difficult to locate another one in the current market. Pop 1; 4 finer, 3 in 62, 1 in 64. Ex Ostheimer Collection, Ex N. N. Coin Co.
1915 Panama-Pacific Expo Dollar. HK-400, Rarity 4. NGC graded MS-65 Brown. Bronze, 38 mm. 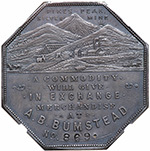 The official medal of the event and was original sold for 20¢ according to the catalog. Hints of turquoise-violet colors below the even old time toning. Plenty of mint luster remaining with some areas still showing red color. Pop 2; 1 finer in 66. Estimated Value $120 - 150. A pair of 1915 Pan-Pacific So-Called Dollars. Consists of: The Official Medal, HK-400, Rarity 4, BU; Louisiana Fund Dollar, HK-406, Rarity 4, UNC. Lot of 2 coins. 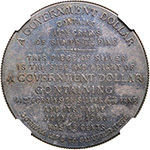 1917 Catskill Aqueduct Dollar. HK-667, Rarity 5. NGC graded MS-63 Brown. Bronze, 38 mm. 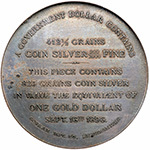 This so-called dollar is a replica of the three-inch official medal of the event. Struck by Metallic Art Co., but the issuer and number struck are not known. A nice quality art piece comparing with other so-called dollars. Pop 7; 8 finer, 4 in 64, 4 in 65. 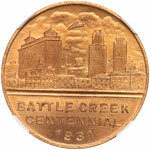 1931 Battle Creek Centennial Dollar. HK-678, Rarity 5. NGC graded MS-66 Red. Reddish gilt bronze, 33 mm. Some small spots visible, but still a flashy choice gem. Rare in this top grade. Pop 5; 2 finer in 67. 1933 U.S. Sesquicentennial Expo - Greenduck Co. Dollar. HK-467, Rarity 3. NGC graded MS-65. 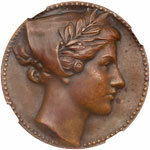 Bronze, 37 mm. Even toning on both sides. Pop 17; 2 finer in 66. 1933 Century of Progress Dollar. HK-870, Rarity 3. NGC graded MS-62. Silver, 40 mm. An iconic piece of so-called dollars, even common but still popular. Lightly cleaned but starting to retone. Some hairlines on the reverse. Estimated Value $75 - 100. 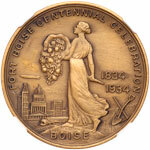 1934 Fort Boise Centennial Dollar. HK-690, Rarity 5. NGC graded MS-64. Bronze, 38 mm. Once lightly cleaned but evenly toned. Actually more difficult to locate than its rarity might indicate. Pop 4; 7 finer in 65. 1936 Kenosha Centennial Dollar. HK-693A, Rarity 5. NGC graded MS-66. Bronze, 37 mm. A nice problem free coin. Pop 5; none finer at NGC. Tied for the finest example graded by both services. 1939 Golden Gate Expo - U. S. Map Dollar. HK-478, Rarity 5. NGC graded MS-66. Gilt bronze, 38 mm. Quite popular and not always available. Rare in top grades. Pop 2; 1 finer in 67. 1948 California Gold Discover Centennial Dollar. HK-497, Rarity 4. NGC graded MS-65. Gold-plated bronze, 40 mm, octagonal. Pop 29; 40 finer, 28 in 66, 12 in 67. Estimated Value $60 - 70.